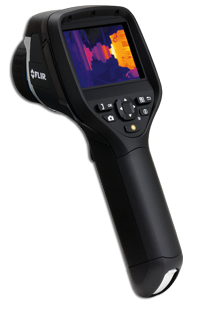 The FLIR E-Series infrared image resolution ranges from 160x120 pixels to 320x240 pixels depending on camera model. Every additional pixel means more valuable temperature information to isolate problem areas. FLIR E-Series thermal imaging cameras withstand a 2 meter drop. They are IP54 rated. An easy-to-access thumbnail image gallery helps you to quickly review and find your thermal images. Large 3.5" LCD color touch screen. The built-in LED lamp ensures quality visual images regardless of job site lighting levels. With a 4 hour battery life its easy-to-replace Lithium Ion batteries will keep up with your demanding schedule. A conveniently located button activates the laser pointer that will help you associate the hot or cold spot in the thermal image with the real physical target in the field. In order to adapt the FLIR E-Series to every situation both wide angle and tele-lenses are available. Connect to smartphone or tablet via Wi-Fi, using the FLIR Tools mobile app (Apple iOS and Android) for processing and sharing results as well as for remote control.